Potato tubers are the subterranean swollen, starchy tubers of the potato plant (Solanum tuberosum L.) and are of utmost importance as staple food for hundreds of millions of people in the world. Potatoes are cultivated in 149 countries (Bradshaw et al., 2010). Potato tubers have been considered a good, succulent feed for farm animals for a long time (Maynard, 1929). Feed-grade potato tubers are culled or discarded potatoes that did not meet market requirements because of size, appearance, diseases, damage, or that were in oversupply (Schroeder, 2012). Potatoes may be fed raw to cattle, sheep, horses and pigs but are best cooked for the latter (Maynard, 1929). Potatoes (Solanum tuberosum) belong to the family of Solanaceae that contains many economically important crops such as tomato, pepper and tobacco (PGSC, 2011). Potato tubers are highly variable in shape and colour. Tuber shapes are of four types: compressed, round, oval and long. Potato skin colour varies from yellow to pink or purple (Custers, 2015). Tuber shape is important for the processing of potatoes (Custers, 2015). For animal feeding potato tuber size is the most important factor since small potatoes may result in choking (see Potential constraints on the "Nutritional aspects" tab) (Snowdon, 2017). As staple food, potato tubers can be boiled, baked, fried, frozen, mashed or made into flour. Potato tubers have to be cooked before being eaten by humans and monogastric animals. A large amount of potatoes is processed into food specialties such as chips, crisps, puree, flour. Potato tubers are a source of high grade starch for industry (Bradshaw et al., 2010). Potatoes have a wide range of industrial applications. They can be used in ethanol prodction, yield pulp for paper industry and they may also provide raw material to the chemical industry (Ecocrop, 2017). As feed, culled potatoes are mostly fed to ruminants in the form of fresh or washed whole tubers, or as chopped material. Potatoes can be ensiled with dry hay, maize stover, or straw as it enhances shelf-life and reduces choking hazards (Schroeder, 2012). 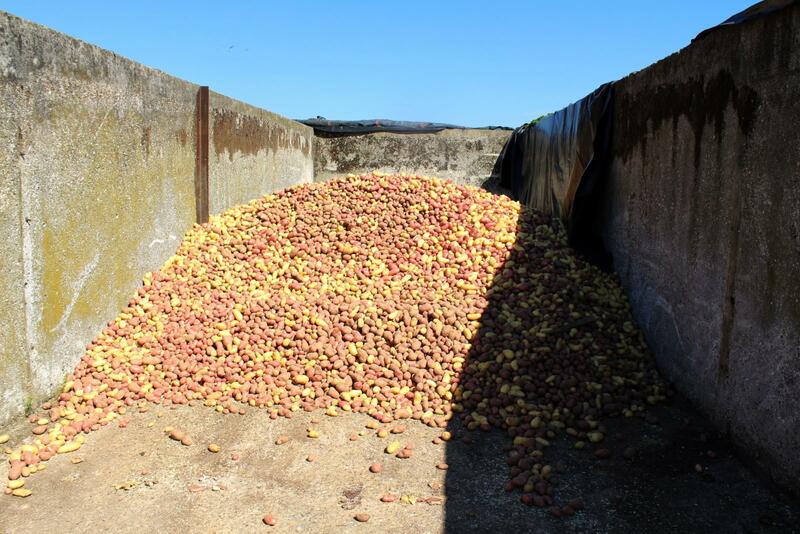 The processing of potatoes yields potato by-products that can be fed to farm animals and are fully described in the "potato by-products" datasheet. Potatoes originated from the Andes. In South Central Chile, wild potato remains date back 12,500 years. Remains of processed potatoes found in Peru could be dated from 7000 years to present. The extensive abandoned cultivation terraces throughout parts of the Andes witness that potatoes were widely cultivated in the Andes before the arrival of the Spaniards (Hawkes, 1990). The introduction of potatoes in Europe was from both the Andes and coastal Chile (Bradshaw et al., 2010). It took some time for the crop to become considered a staple food in Europe. Ireland was the first country that adopted potatoes at the end of the 17th century, as its agroclimatic, societal and economic conditions were favourable to the crop. Potato production supported an outstanding increase in Irish population that raised from 2 million to 8.5 million in 1.5 century. Unfortunately late blight, a potato disease, occurred and resulted in a tremendous famine in Ireland in 1846. In other parts of Europe, potato cultivation was promoted by food shortages that occurred during the 18th century. Potatoes were further promoted worldwide by all European colons and missionaries (Bradshaw et al., 2010). The potato is the world’s fourth most important food crop after maize, wheat and rice with 381 million t (fresh weight) of tubers produced in 2014 (FAO, 2017). Potatoes are cultivated in 149 countries (Bradshaw et al., 2010). In 2013, the top 10 potato producers were China, India, Russia, Ukraine, the USA, Germany, Bangladesh, Poland, France, and The Netherlands. They accounted for 65% of world production (FAO, 2017). In 2005, for the first time, potato production in developing countries exceeded that of the developed world (FAO, 2008). Potatoes are a high moisture, bulky and perishable material requiring high costs of transport and storage installations. Potatoes are having limited export potential, confined mostly to cross-border transactions. Overall traded potatoes remain low (only around 6%) in spite of an important increase in the trade of processed potatoes (FAO, 2008). In 2013, out of a world production of 381 million tons, 47 million tons were used as feed, 35 million were considered to be losses and 12 millions were processed (FAO, 2017). It is possible to make potato silage mixed with freshly cut forage but good drainage has to be provided as the juicy losses may be high. Another constraint is that fresh forage is available when potato supply is low. Once silage is ready, its DM content should be higher than 25% and the potato starch is cooked by fermentation which reduces the risk of choking (Halliday, 2015). Worldwide average fresh-weight yield is 19.9 t/ha but there are important variations among producing countries, and between regions in large countries. Yields as high as 120 t fresh weight/ha have been recorded in Australia while the most important producer, China, has yields of only 16 t/ha (FAO, 2017; Bradshaw et al., 2010). 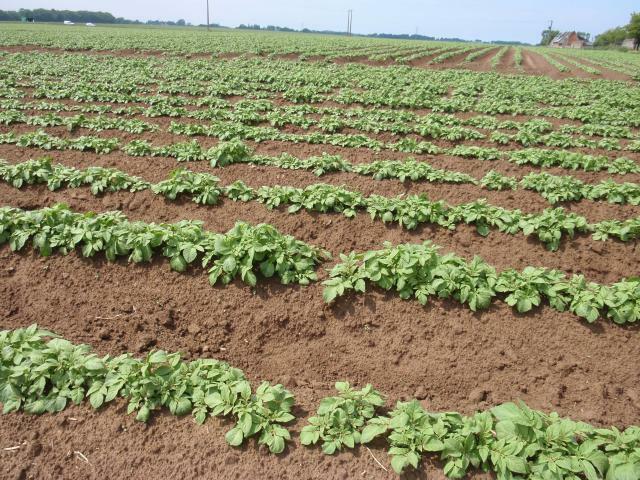 Potato is a fast growing species and its tubers can be harvested in 75 days under favourable conditions. In most cases, it is harvested within 120-150 days after planting (Bradshaw et al., 2010). If potatoes are intended for food, they should be held at 15°C to 25°C for up to 15 days to permit suberization, a process that promotes wound healing and reduces invasion by storage pathogens. In some regions, it is possible to benefit from night cooling temperatures and thus spare cooling costs. Thereafter, potatoes are stored at 5°C to 10°C to minimize the conversion of starch to sugars (Rennie et al., 2003). Since potatoes are bulky feed with high transportation costs, the livestock farm should not be further than 25 km from the potato grower. It is important for potatoes to be free of stones before being delivered to the farm, as rocky material may be deleterious to farm equipments (Snowdon, 2017). When fresh culled potatoes are to be fed to livestock they should preferably be stored in an insulated building but this is a costly solution (Snowdon, 2017). Potatoes can thus be stored in a bunker silo where they will be covered with straw (rather than plastic sheet) in order to prevent deleterious light-greening (Vergonjeanne, 2015). If culled potatoes have been previously washed and stored in a cold chamber, they can be put in bunker silos but should be fed within 1 month as washed potatoes readily decay (Snowdon, 2017; Vergonjeanne, 2015). Because they are heavy feeds, potatoes are best suited for farms that are well mechanized (Snowdon, 2017). Potatoes can be spread on the ground at least 15 cm thick and in sufficient quantity to prevent competition between animals that could gulp down small potatoes and suffer from choke. Potatoes can also be distributed in a trough and the animals should be maintained by headlocks so that they do not raise their head while they are eating. If cattle is fed outdoor, it might be useful to use an electric fence 60-75 cm above the bunk (Snowdon, 2017). Surplus and cull potatoes, either raw or after cooking (the water should be discarded), are suitable for most classes of livestock. To get the most value from the starch, the potatoes should be boiled or steamed. Although potatoes are mainly considered an outmust important source of starch, they contain high-quality protein in small amounts (2% fresh basis, i.e. 10% DM basis, which is comparable to cereal grains). Potatoes are an excellent source of lysine, but low contents of sulfur-containing amino acids limit their nutritive value (Friedman, 1996). They also provide significant amounts of vitamin C (potatoes cooked with their skin could support 25-50% of the daily recommendations of ascorbic acid), vitamins B6 and B1, folate, of the minerals potassium, phosphorus, calcium and magnesium, and of the micronutrients iron and zinc (Bradshaw et al., 2010; Naidu, 2003). Potassium is the most abundant of the minerals provided by potatoes (Bradshaw et al., 2010). Frozen solid, dirty, rotted or decayed potatoes should not be fed to livestock. Raw potatoes were reported to have bitter taste and tended to increase the flow of digestive juices in ruminants. They should not be fed with other feeds that tend to irritate the digestive system (Maynard, 1929). It is possible for cattle to choke on whole potatoes. However, it has been reported that cattle can learn to eat whole potatoes within two weeks and that the risk of choking dramatically drops after this learning period (Bradshaw et al., 2002). Symptoms of choking are heavy salivation with head and necks extended. keeping cattle heads down thanks to low rails over the troughs while they are consuming the potatoes (Fiems et al., 2013; Bradshaw et al., 2002). Frozen solid potatoes that have been stored in silo during winter should not be fed because animals can not chew them and are likely to choke while attempting to swallow them whole (Bradshaw et al., 2010). Like other members of the Solanaceae family, potatoes contain toxic glycoalkaloids that are present in the form of solanine and α-chaconine. While these active substances contribute to potato flavour at low level, they become toxic to humans when their concentration is above 20 mg per 100 g fresh tubers, and this concentration is 3 to 10 times greater in the peel than in the flesh (Cantwell, 1996). The alkaloid concentration of potato sprouts and green peels that have been exposed to light is considerably increased by light exposure in warm conditions. Potato sprouts should thus be removed before being fed to livestock, and sunburnt potatoes that have green skin should be avoided or not fed in large amounts (Bradshaw et al., 2002; Nicholson, 1974). Cases of poisoning due to potatoes have been reported in animals fed on peelings and sprouts from old potatoes left at sunlight (Nicholson, 1974). Signs of toxicity were staring eyes, dilated pupils, trembling, staggering, weakness, diarrhoea, sometimes convulsions and sudden death (Nelson, 2010; Bradshaw et al., 2002; Nicholson, 1974). Potatoes are submitted to a wide range of pesticide treatments. Animals could be sensitive to pesticide residues. However, if Maximum Residue Levels are respected, there is little danger from pesticide residues (Nicholson, 1974). The EU recorded MRL for 482 active sustances used in potatoes (EU Pesticides database, 2017). Since the end of the 1980s, potato by-products and culled potatoes have been suspected to cause cysticercosis or "beef measles" (Bradshaw et al., 2002; Nelson, 2010). Cysticercosis is due to encysted eggs of Taenia saginata, the human tapeworm. In Pacific Northwest States of the USA, it is recommended that whole potatoes are not used as feed unless they have been washed (Bradshaw et al., 2002). Feeding large amounts of potatoes will result in excessive starch bypassing the rumen which can cause digestive upsets when it reaches the lower intestinal tract of ruminants (Snowdon, 2017). In monogastric animals, a small but significant portion of potato starch is resistant to digestion in the stomach and the small intestine. When it reaches the large intestine it has the same effects as fibre. It provides bulk, improves glucose tolerance and insulin sensitivity, reduces plasma cholesterol and triglycerides, increases satiety, and possibly even reduces fat storage (Bradshaw et al., 2010). This can result in lower intake and growth performance in pigs (Blair, 2007). This trait is used in human diets to manage feed intake and reduce body weight (Bradshaw et al., 2010). The protein of raw potatoes contains a powerful protease inhibitor and is thus poorly digested by monogastrics (Whittemore et al., 1975). This inhibitor is heat labile and thus absent in cooked potato (Livingstone et al., 1979). The inhibitor has been shown to cause a reduction in N digestibility not only in the potato itself but also in other feedstuffs of the diet (Edwards et al., 1990). After an adaptation period ruminants readily consume raw potatoes in spite of their bitterness (Snowdon, 2017). Potatoes are a good source of energy, comparable to good maize silage for ruminants. Their main component is starch, a valuable form of energy for both fattening and milk producing animals (Maynard, 1929). Potato protein, though present in small amounts, is considered to have a high biological value with favourable amino acid composition (Halliday, 2015). Raw potatoes, with their high water content, may have a laxative effect. Therefore they should be introduced gradually (Göhl, 1982). The low levels of both protein and fibre of potatoes suggest that they should be supplemented by protein rich feeds and roughages in ruminant diets. Because they are bulky material with almost no fibre, potatoes should be considered as high moisture grain replacer rather than roughage. Dairy cows can receive up to 15 kg of raw potato a day and beef cattle up to 20 kg a day. If cattle are given no more than 20 kg a day, it is a good feed that will in no way impair health (Göhl, 1982). Though it was possible to include up to 50% (DM basis) potatoes in cattle diets, and though some cows have been reported to consume over 45 kg cull potatoes per day, it has been recommended to limit potato intake to no more than 30% for optimal animal performance (Snowdon, 2017). Studies assessing the inclusion of culled potatoes in ruminant diets are rarer than those evaluating the inclusion of potato by-products. Since some by-products, such as screen solids, may have a composition close to that of raw potatoes, data from potato by-products were also used to assess nutritional aspects of culled potatoes for ruminants (Charmley et al., 2006). Culled potatoes are characterized by a low DM content, between 16 and 25% (Fiems et al., 2013; Eriksson et al., 2009; Charmley et al., 2006; Bradshaw et al., 2002). They are mainly composed of starch, with relatively low contents of protein, minerals and fibre, and they are used as energy concentrates (Charmley et al., 2006). The metabolizable energy (ME) value of culled potatoes is high, similar or slightly higher than that of barley with reported values between 11 and 14 MJ/kg DM (Nelson, 2010; Charmley et al., 2006; NRC, 2001; NRC, 2000; Sauvant et al., 2004). Starch from uncooked potato is more resistant (slowly degraded) in the rumen than that of barley or wheat likely, because starch granules are larger in potatoes than in barley or wheat and contain higher proportion of amylopectin (Monteils et al., 2002). This relatively slow rate of rumen metabolism should result in a more balanced rumen pH and better utilization of nutrients by rumen micro-organisms and a better utilization of starch by the animal (Charmley et al., 2006). However, due to the low fiber content of potatoes, it cannot be excluded that a high inclusion rate can result in ruminal dysfunction if the basal diet does not contain enough fibre (Fiems et al., 2013). Cooking potatoes strongly increased rumen fermentation rate of starch, while deep freezing did not alter the properties of raw potatoes (Eriksson et al., 2004). Culled potatoes are above all used as a high energy feed for beef feedlots. It has been considered that increasing the inclusion of culled potatoes and potato by-products beyond 20% DM of the diet resulted in a decline of DM intake (Charmley et al., 2006) but huge discrepancy about this inclusion rate exits between studies (Nelson, 2010). A reason for that may be that the adaptation to a potato-based diet lasted approximately 6 weeks, which may contribute to the reduction in DM intake in the early feeding phase (Bradshaw et al., 2002; Charmley et al., 2006). The inclusion of culled potatoes at 30% (DM basis) in the diet resulted in higher intake of finishing cows when culled potatoes replaced the concentrate, whereas this level of inclusion had not significant effect on intake when culled potatoes replaced maize silage (Fiems et al., 2013). Culled potatoes did not affect daily gain, body weight, most carcass parameters (weight, composition, lean and fat content) and meat quality (colour, moisture, fat and protein content, pH, water-holding capacity, WB shear force). Only carcass dressing percentage was lowered with the inclusion of culled potatoes. Feed efficiency was also unaffected by the inclusion of culled potatoes (Fiems et al., 2013). Finishing bulls were fed on a diet containing a fixed amount of culled potatoes (about 50% dietary DM) and concentrate with maize silage given ad libitum. This diet was compared to diets containing only a fixed amount of concentrate with maize silage offered ad libitum or a fixed amount of concentrate with a mixed silage composed of maize and beet pulp. Dry matter intake was lower on the diet including culled potatoes but energy content on this diet was higher. Daily gain and feed efficiency were also higher on that diet including potatoes compared with the diet including maize silage alone. Carcass and meat characteristics did not differ between the diets containing either culled potatoes or maize silage alone (Boucqué et al., 1994). Because potatoes are bulky material with nutrients diluted in high water content, it has been questioned if a high producing cow can consume sufficient amounts of potato to fully replaced grain (Eriksson et al., 2009). In a comparison between 4 sources of starch for dairy cows, potatoes could not compete with cereal grain such as wheat or maize for either milk yield or milk fat content. Cows fed on potatoes had also the lowest milk protein, milk lactose and milk solid non-fat yields. Starch from potatoes was not more valuable than cereal starches (Mosavi et al., 2012). Moreover, large amount of potatoes (25% DM) can be difficult to accept for some cows (Eriksson et al., 2009). A good use of potato in lactating cows was as a partial replacer of cereal grains in order to reduce feed costs (Jans, 1989). In Colombia, medium-yielding Holstein cows (15 kg milk/d) in their second period of lactation that were grazing on good quality pasture (kikuyu grass (Pennisetum clandestinum) at 26% CP) could be supplemented with potato tubers at 6 or 13 kg/d/cow. The two supplementation levels resulted in higher milk yield, higher milk protein and higher true milk protein. However, it was not necessary to feed the higher level of potatoes as the animal performances were similar at 6 and 13 kg potatoes (Montoya et al., 2004). Raw potatoes are unpalatable to pigs and are not well digested (Braude et al., 1951). This poor digestibility is probably due to the presence of starch granules that resist to amylase in the digestive tract of pigs and also to several antinutritional factors such as solanin, and protease inhibitors contained in raw potatoes. Much of raw potato starch passes undigested into the low intestine where it is degraded by bacteria, usually resulting in digestive upsets (Livingstone, 1985; Whittemore, 1977). Raw potatoes should be avoided in pig diets. Cooking potatoes modifies starch resistance to digestion enzymes, and destroys or removes antinutrional factors (Lewis et al., 2001). Only cooked potatoes from which cooking water (that contains water-soluble solanin) has been removed can be fed to pigs. They are efficiently used by fattening and breeding animals, which can be fed up to 6 kg a day (Göhl, 1982). Potatoes produce a firm pork (Göhl, 1982). Cooked potatoes are mainly a source of energy (in the form of starch) for pigs. The protein content of potatoes is similar to that of maize and the fibre and mineral contents are low at the exception of potassium. Their main limitation is their relatively low DM content and consequent low nutrient density (Lewis et al., 2001). Potatoes are also very low in magnesium which is not usually added to pig diets. Special attention should be paid to this mineral to ensure it is not deficient in pig diets containing potatoes. Potato protein has a high biological value, among the highest of the plant proteins, similar to that of soybeans. Potatoes have a high lysine content which makes them an ideal complement of cereal protein. The first limiting amino acids in potatoes are methionine and isoleucine (Blair, 2007; Lewis et al., 2001). For optimal energy value, potatoes intended for pig feeding should be boiled for 30-40 min, steamed at 100°C for 20-30 min or simmered during 1 hour and then quickly cooled. These heat treatments disrupt the granular structure of the starch which can subsequently be broken by digestive enzymes. Prolonged heating or slow cooling are not recommended as they damage potato protein and reduce its digestibility (Edwards et al., 1990). After heat treatment, it is considered that cooked potatoes are similar to maize for digestible energy and protein, and are palatable to pigs of all ages (Blair, 2007). Recommended level of cooked potatoes in growing and finishing pigs is up to 6 kg per day, representing about 50% of the dietary DM (Pond et al., 1984). Growth performance has been shown to be similar when cooked potato replaced ground maize in grower-finisher diets. Problems with reduced nutrient intake were only likely to occur in young animals unable to consume the necessary daily bulk (Edwards et al., 1990; Whittemore, 1977). Growth response was also similar in young pigs given diets containing either cooked potato flakes or maize meal at 780 g/kg. In general, about 4 kg of cooked potato could replace 1 kg of barley as a source of energy and protein in the diet (Blair, 2007). Pigs could be fed ad libitum on cooked potatoes and a concentrate (1.0-1.15 kg/d) that supplied the remaining energy and nutrient needs. One benefit of potato feeding was a firm backfat. Another finding was that pellet quality of the diets was improved, the diets containing potato flakes or flour being firmer than those containing cereals (Pond et al., 1984). To avoid overfatness, dry sows should be restricted daily to 4-6 kg of cooked potato fed in conjunction with 1 kg of a supplementary concentrate, suggesting a similar daily amount (5-7 kg depending on live weight and litter size) in conjunction with a higher level of supplement for lactating sows (Edwards et al., 1990). Cooked potatoes can be used for poultry, to which they have been fed successfully at up to 40% of the total ration. Inclusion of cooked potatoes at up to 20% in poultry grower diets yielded good results. Higher inclusion levels had depressive effect on animal performance (Whittemore, 1977). When potatoes were included in pelleted diets the pellets became harder, feed intake was reduced and the litter became progressively wetter as the level of potatoes in the diet was increased. 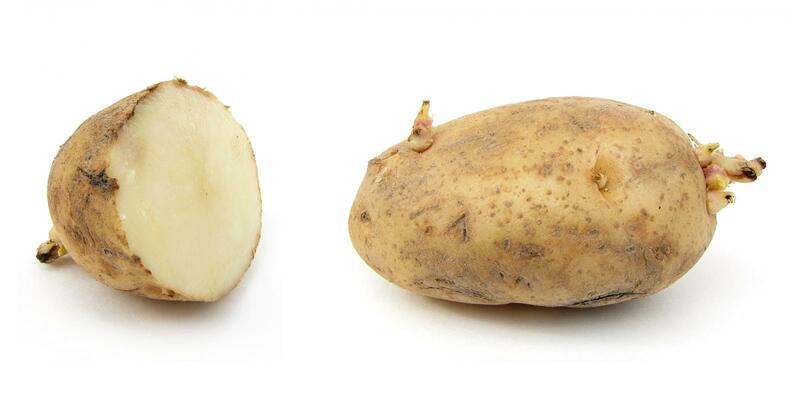 The wetter litter might have resulted from an increased content of potassium in the diet, being almost doubled as the level of potatoes increased from 0 to 40% (Whittemore, 1977). In laying hens, egg production was significantly lower when the diet contained 20% potato meal and the droppings tended to be wetter, even though the dietary ME content increased with the level of potato meal in the diet. A dietary inclusion rate of 15% potato meal gave satisfactory egg production (Whittemore, 1977; Vogt, 1969). The potato tubers are included in the list of ingredients traditionally used to feed rabbits since a very long time in Europe, in France and in the UK for example (Cazin, 1868; Charon, 1927; Watmough, 1936). If the raw potatoes can be distributed with benefit to rabbits (Smirnov, 1961), the most generally recommended form is as steamed or boiled potatoes, mixed with some wheat bran and distributed as more or less lumpy mash (Charon, 1927; Benoit et al., 1948). This type of utilisation is still common in some European familial or even commercial rabbitries (Kuzniewicz et al., 1979; Schlolaut, 1995; Resti, 1995; Michalik et al., 2009) but is also used in African countries such as Tanzania where potatoes are cultivated (Mgheni, 1979). In pelleted balanced diets, dehydrated steamed potatoes were tested with an incorporation level up to 31% to replace cereals and wheat bran, and resulted in a significant growth improvement (Wojsyk-Kuzniewicz, 1981). In fact, the limit of incorporation level is mainly the respect of the diet's balance for energy, protein and fibre. Different studies were conducted to estimate the digestion conditions of starch in the rabbit digestive tract. Their conclusion is that potato starch is almost completely digested in the rabbit's whole tract (99% minimum) and intermediary digestibility at the end of the small intestine is 97-98%, an efficiency a little bit better that for maize starch (Pinheiro et al., 2000; Blas et al., 2010). Potato tubers, raw or steamed, are a good source of highly digestible energy for rabbits (about 15-16 MJ/kg DM), with a very low level of fibre (3.5-4.0% ADF) and a content of protein similar to that of cereals (10-11% of DM). Unlike cereal protein, potato protein provides a sufficient proportion of lysine (about 100% of requirements), but are deficient in sulphur-containing amino acids, covering only 50% of growing rabbit's requirements (Lebas, 2013). Besides their utilisation fresh or dehydrated, potato tubers can also be used in rabbit feeding after ensiling (Piatek et al., 1986; Schlolaut, 1995). The traditional recommendation is to make mixed silage of cooked potatoes together with clover, alfalfa or fresh and healthy vegetables (Benoit et al., 1948). If the potato tubers are submitted to light for a long time they become green by developing chlorophyll, and simultaneously the content of TGA is increased (Shaw et al., 1983). If most tubers are green, they become toxic if used in rabbits feeding. For example, growing rabbits became dull and showed reduction in body weight after 30 days of green potatoes feeding (20.4 mg TGA/100 g), but no problem was observed with non-green potatoes (7.5 mg TGA/100 g) (Azim et al., 1982; Kuiper-Goodman et al., 1993). As a precautionary measure, a potato batch with a high proportion of green tubers should not be used in rabbit feeding, but if only some green tubers are observed there is no problem. In addition, it must be reminded that boiling potato tubers reduces the TGA content of potato tubers by about 20% (Ostry et al., 2010; Lachman et al., 2013). A mixture of cooked carrots and potatoes was fed to crayfish and compared to other feeds such as fresh fish cubes or trout pellets. Crayfish fed on vegetables had higher mortality than other crayfish (30% vs. 15 or 5%) (Miron, 2004). Kuiper-Goodman, T.; Nawrot, P. S., 1993. Solanine and chaconine. WHO Food Additives Series 30, Inchem ed. Schlolaut, W., 1995. The large book about rabbits. DLG Verlag, Frankfurt am Main: 396 pp. Whittemore, C. T., 1977. The potato (Solanum tuberosum) as a source of nutrients for pigs, calves and fowl - A review. Anim. Feed Sci. Technol.